Sunday was another case of turn up, cast the barbel baits in, sit around for a few hours, wind the baits in and go home. Although there had been some rain the river was low and had a greenish tinge to it, but warm enough for some action to be expected. None happened though, not even a chub knock or two. The early part of the week was committed to work, but when Thursday came around I was unexpectedly able to nip out and buy some 'maggits' for a perch session on Friday. I still had some lobworms wriggling in a tub so that seemed like a good plan. Unfortunately the weather forecast I heard as I rolled out of my pit at half five turned out to be correct. The wind wasn't too bad as I got to the water, and I got set up in the dry. Then the rain arrived, followed swiftly by the wind gathering strength. The rain actually abated around midday - but the wind gathered even more strength. Although the air temperature was into double figures the wind chill made it feel much colder. Bites were hard to come by through the early part of the morning. It was areal struggle. 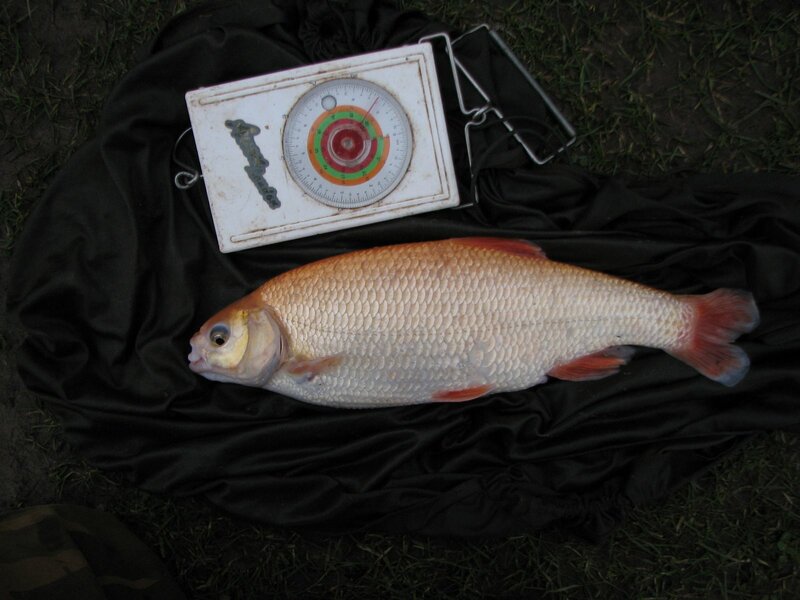 A carp was lost around ten thirty, and finally a perch was landed to a bunch of red maggots at quarter past eleven. This proved to be the smallest perch I've had from the lake at a pound and a quarter. After lunchtime bites started to come more frequently, but not from perch. The first surprise was a couple of decent roach, the second was a brace of golden orfe. I wasn't aware that there were any in the place. The first weighed 1lb 12oz, and the second looked its twin but was an ounce over 2lb. Never having caught a golden orfe before that was two PBs! Just before five I landed an imitation crucian, I assume it was an F1 thing but I'm no expert on these matters. By then I was starting to wish I wasn't there and began the task of dismantling the Aqua brolly. I must say that this has been a Godsend on the windy days I've fished this winter. Once pegged down with the stormpoles in place it stands up well and the stormsides keep the wind off me and the bobbins. Without this brolly I'm sure I'd not have lasted as long as I did today before packing up.